RogerKastel.com is the official online home of world renowned artist Roger Kastel. Roger Kastel is an award-winning artist whose work is instantly recognized in popular culture. Roger's talent has been sought after by legendary filmmakers, authors, publishing houses, and production studios. The result has been iconic imagery that will remain timeless. At RogerKastel.com you will learn everything you ever wanted to know about the man behind some of the most memorable movie posters as well as hundreds of pocketbook covers and illustrations. 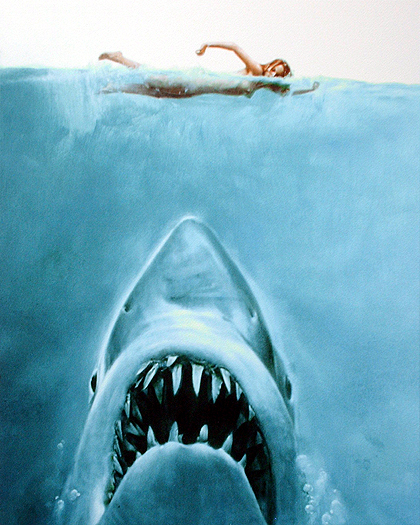 JAWS: Legendary painting featured on the cover of the paperback edition of the Peter Benchley novel as well as the poster for the blockbuster Steven Spielberg film. Star Wars - The Empire Strikes Back: Movie poster for the second episode in George Lucas' original Star Wars Trilogy. Doc Savage: Movie poster and cover art for Issue #1 of the acclaimed 1975 Doc Savage comic book series.